On 10 November 2018, the UNIS Hanoi girls basketball team won the Jr. MRISA tournament in Phnom Penh, Cambodia. The road was long and hard, starting way back in the hot and humid end of August. The season began with a bit of uncertainty. The team only had three players returning from last year: Abi, Jada, and Sophia. 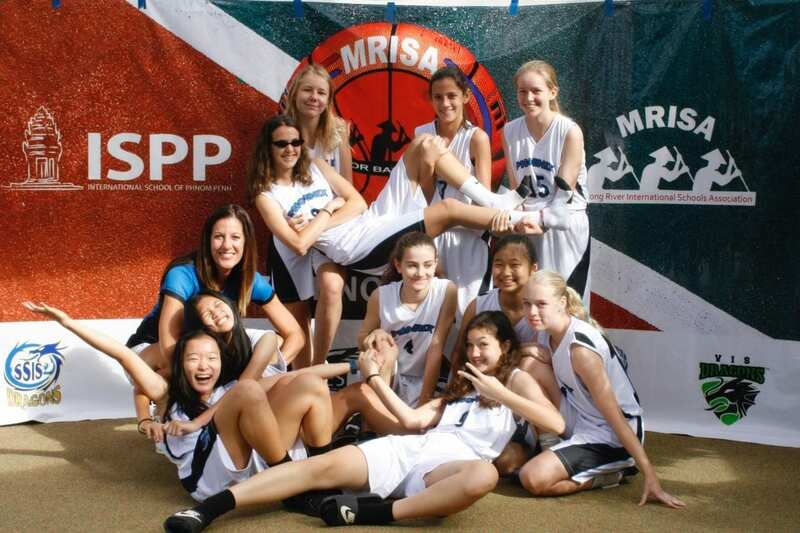 The rest of the team, Beeke, Celina, Lisa, Lily, Michelle, Ngoc, Trang, Luna, and Kiara were new to MRISA Basketball. Four out of the nine newcomers were even new to the sport. However, as practices began, the team slowly grew in confidence. We won our first game, beating HIS 40 to one. Despite the score, the entire team groans whenever the game is mentioned. With the awful rainbow passes, horrible shooting form, and confusion during the inbound plays, we all recognize it was not our best game. Practices didn’t get easier. With pushups, stair laps and the endless suicides, we were always dripping with sweat by the time they were over. But, with every practice and the seven games that followed, we got better and closer as a team. We weren’t just individual players anymore. We were becoming teammates, thanks the guidance of our amazing coach, Coach Cortney. The regular season ended with the Hanoi Athletic Conference (HAC) Tournament on the 3rd of November. After winning three games in five hours, we walked away with the championship trophy, and so did the boys. After that tournament, we only had one more practice before getting on a plane for the MRISA tournament in Cambodia. Some of us were nervous, but we all knew that we hadn’t come to this tournament as individuals. We had come as a team. We were ready for whatever Cambodia threw at us. On the first day, many of us had to wake up at 5:30 a.m. Even with the early start, we played our first game, winning 28 to 20 against South Saigon International School (SSIS). 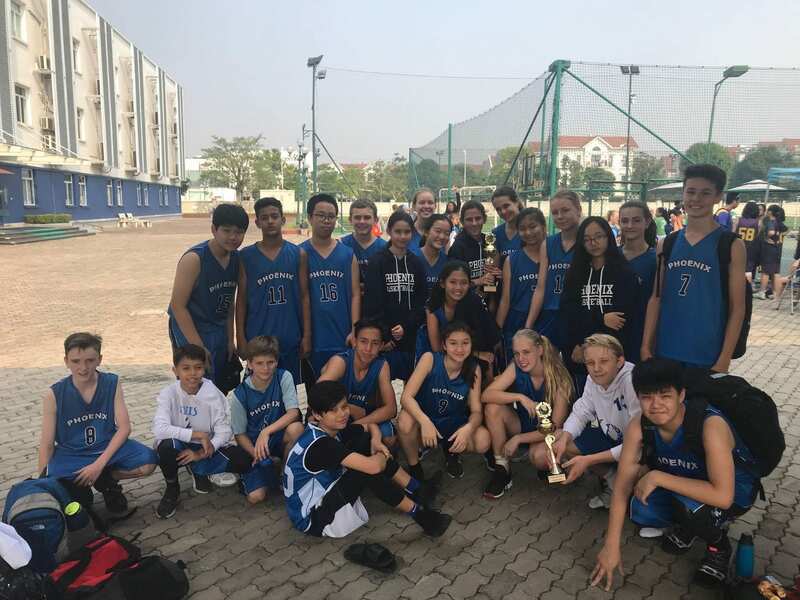 With a boost in our energy and excitement, we did well in our next two games against the International School of Eastern Seaboard (ISE) and the International School of Phnom Penh (ISPP), outscoring both by a total of 33 points. After our game against ISPP, Coach Cortney told us she hadn’t won against ISPP in the last five years. We hadn’t known that, and cheered even louder than when we had won the game. On the morning of our second day, Coach sent us us a message on Whatsapp, saying, “I saw the forecast for today. Sunny with a chance for UNIS Hanoi to be first seed!” She was right. We outscored our next two opponents by a total of 60 points, and went 5 – 0 in the round robin. That meant we were the first seed in the playoffs. Our semi final game was against Vientiane International School (VIS). Thanks to our incredible defense, we won 34 to 4. One of our teammates whispered on the bench, “Oh my god. We’re completely shutting them down.” She was right. And Coach Cortney was right about the endless defensive drills during practice. They were the key to us reaching the finals. Right before the championship game started, Coach pulled us all aside into our last team huddle. She told us that this was why were were there. This was what we had trained for. We were ready, and it was time for us to play our game. And we did. From the first blow of the referee’s whistle, we were playing our game. We ran our offense, Jada and Sophia with their incredible two-man play. We did our defense, all of us on our toes in case someone needed help. We played the way we knew we could play. Finally, with all of us breathing hard, it was down to the last few seconds of the game. It was our ball, and we were up 30 to 10. The ball was passed in, we held it, and the buzzer sounded. The stands and bench exploded. We all ran up to each other. We hugged, we high fived, we celebrated so much we accidentally threw each other on the ground. “We did it! We actually did it!” We were the middle school girls basketball team from UNIS Hanoi, and we were MRISA Champions. 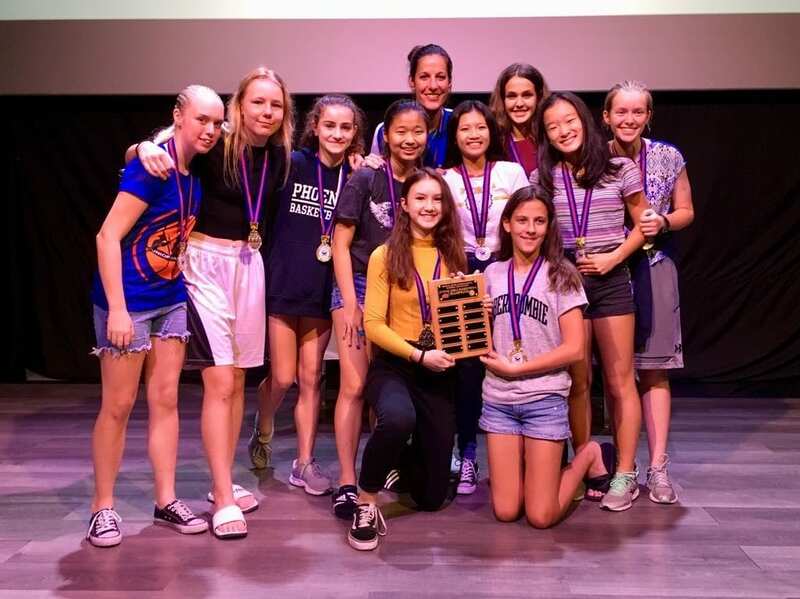 As our teammate Sophia said, “Our team has grown a lot in this season and it’s amazing how many of our players went from never playing basketball to winning a gold medal.” Because of everyone’s hard work, everyone who was cheering us on, and, most of all, to Coach Cortney, we won. But, we didn’t just win at MRISA. We won as a team throughout the entire season, all twelve of us.